SKY Alive tour is happening on Feb 17-19 from 10am till 10pm at SM Lanang Premier in Davao. There will be interactive booths, games and lots of exciting giveaways from our favorite cable TV channels. And it's FREE admission! Gracing the event are the stars of HBO’s dark fantasy thriller, Halfworlds' Filipino actor Jake Macapagal and Thai actor Charlie Ruedpokanon. Fans can get the chance to meet and greet Jake and Charlie on February 18 and 19 from 4-5 PM at the “Halfworlds” booth. Halfworlds is now on its second season airing every Sunday at 9 PM on HBO. It explores the secret society of concealed demons and monsters living alongside humans. Guests will also get the chance to test their knowledge of all things Oscars at the Movie Trivia zone. The RED by HBO booth features basic Kung Fu techniques and stances just like in the HBO Original movies Master of the Drunken Fist: Beggar So and Master of the Shadowless Kick: Wong Kei-Ying. RED by HBO is a channel dedicated to showing acclaimed, award-winning, and popular movies and series from East and South East Asia. Meanwhile, fans of Kapamilya Mas Winner Ka have the chance to see the cast members Rovic Cuasito, Cherry Manning and Redge Ledesma together with Lady Bam and Onnie Alfaro of MagTV Na Magnegosyo Ta are coming over on February 19 at 3PM. 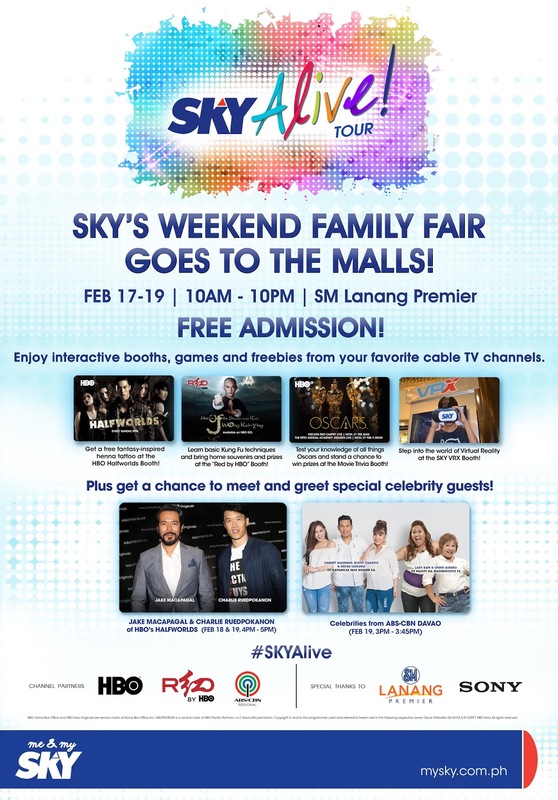 The SKY Alive Tour in SM Lanang Premier Davao features best cable experience with HBO, Red By HBO, ABS-CBN Regional, SKY and SONY.